I don’t often do crafty things; mostly because I’ve no patience for tedious tasks, which I often feel most crafts are, or because I’ve no time. This month, I’ve been slowly adding decor pieces both inside and outside of our house to make it a bit more festive for myself and the kids. I’ve mummy wrapped the door and hung the wrap from the porch ceiling (complete with cockroaches! ), and I’m working with a national retailer on a fall decor piece which will be featured soon, so yesterday the craft bug bit me. Better the craft bag than the fake cockroaches on the porch. What I love about these pumpkins is that you don’t have to be perfect; you can get messy. See my purple pumpkin? The kids got a little zealous with the puffy paint and it smeared but it still looks great on our porch. They’re easy and quick to make and can allow for so much more creativity if you’re a skilled crafter. I made a trip to Michael’s to purchase my supplies. Purchase a fake, or paint a real pumpkin. I prefer the white background for this craft because it looks like it’s glowing, even during the day, and it creates a good contrast for the lettering. Set the pumpkin in your yard or on your porch on top of wax or other paper. Make sure you’re in a well-ventilated area. Carefully coat the pumpkin with Krylon Glowz spray paint. Apply several coats, allowing 15 minutes in between each coat. Using adhesive rhinestones, jewels or black or glow puffy paint, create your design. 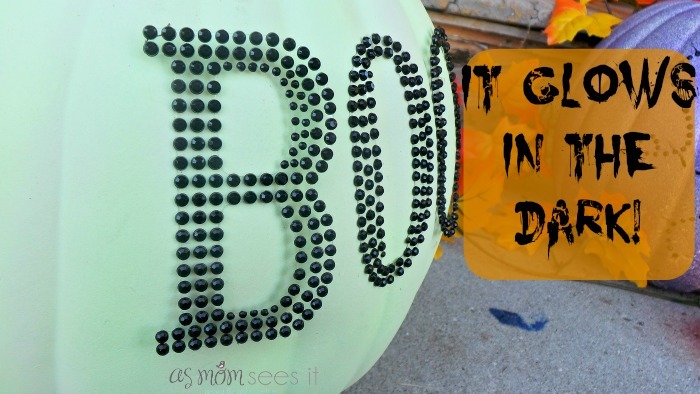 We used Recollections adhesive rhinestones for our ‘Boo’ that’s on our pumpkin. Once it charges during the sunlight, it will give the pumpkin a cool looking glow at night, but it’s also very pretty during the day. We found that because of the surface, we did need to use super glue to keep the lettering on despite it’s adhesive backside. These are my favorite because, like the glow pumpkins, they’re pretty day and night. You can choose your favorite colors, school colors, or the colors of your favorite sports team. Just as with the glow pumpkin, place your pumpkin in a well ventilated area. You can choose the white background if you want the color to pop, or do something crazy like purple on black or black on orange. The fun is endless! Using Krylon Glitter Blast spray paint, which is available in a ton of fun colors. 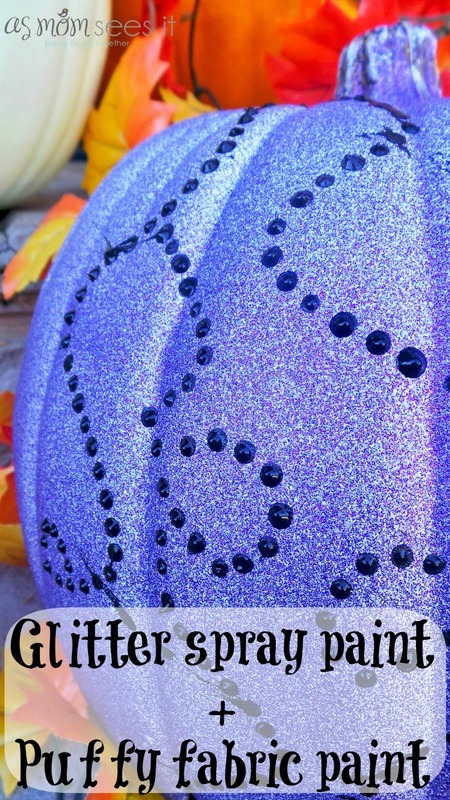 We used purple on our white pumpkin and we also are using Confetti Pop, a silver, on our orange pumpkins. Coat the pumpkin with one or two coats, depending on how deep you want the color. You don’t really need any more than that. Then use black or glow puffy paint to create designs, address number, names or other decor. 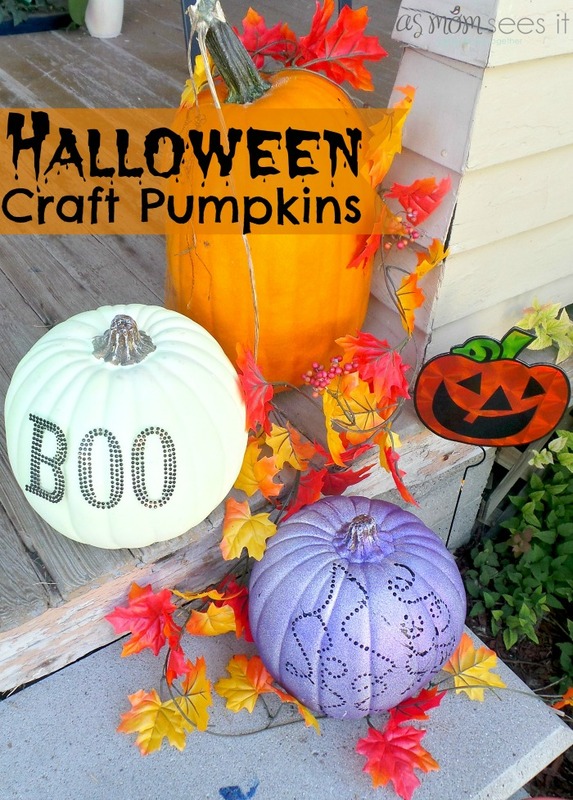 CLICK HERE FOR OUR GLOWING PUMPKIN JARS CRAFT! 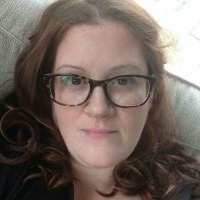 I love you’re pages of great craft ideas! Please send me some more Halloween craft ideas!